Description: This seared Tuna Steak recipe is sure to be a hit! The blend of the sweet Honey Glaze combined with the heat from the Wasabi Cream sauce is a perfect recipe for the grill! A fish steak, alternatively known as a fish cutlet, is a cut of fish which is cut perpendicular to the spine and can either include the bones or be boneless. Fish steaks can be grilled, pan-fried, broiled or baked. While beef steak takes time to cook and can be tough, fish cooks rapidly, is tender, and tends to fall apart. Fish steaks are less likely to fall apart than fish fillets. Unlike beef steak, fish steaks are often baked in a sauce. 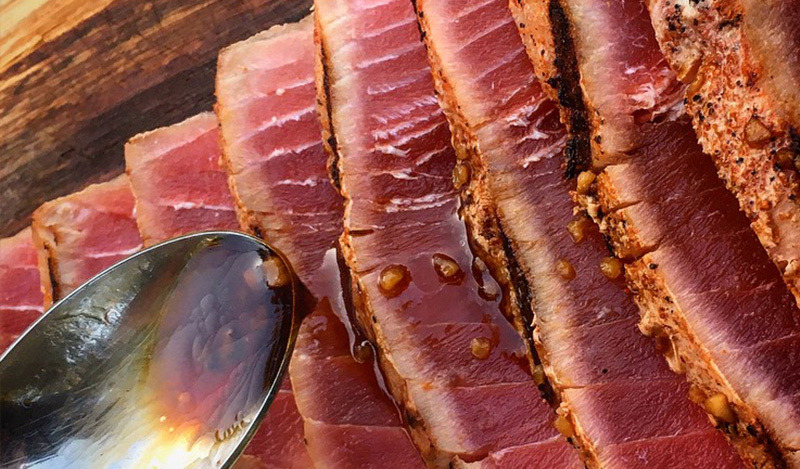 This seared Tuna Steak recipe is sure to be a hit! The blend of the sweet Honey Glaze combined with the heat from the Wasabi Cream sauce is a perfect recipe for the grill!